FAME'S PRICE: Fame cast members Quinton Anderson, Milly Grant and Haydon Timoko are ready to sweat. The 80s are back. 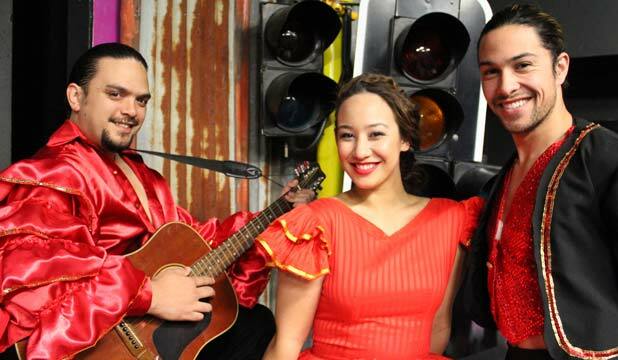 Manukau Performing Arts' production of Fame, the Musical opens tomorrow night at Spotlight Theatre in Papatoetoe. "The show is going to be big," says actor Haydon Timoko, who plays hip hop dancer Tyrone Jackson. The show is based on the 1980 musical film Fame and tells the story of students attending New York's High School of Performing Arts. The cast of 25 includes Milly Grant who has has just finished starring in The Factory which was part of the Auckland Arts Festival, and Quinton Anderson who bagged a Northern Area Performance Theatre Award for Best Supporting Actor in 2012. Timoko recently featured in Awkward Altars. "We're at different stages of our careers, some are really fresh and others have experience in different areas so you get to mix it up and learn off each other," says Grant, who plays lead Carmen Diaz. "There's a lot of manaakitanga here at Manukau Performing Arts and you don't always get that in theatre. Anderson, who plays funny guy Joe Vegas, says Fame and theatre combines his favourite things. "People should see it because it's a great time warp back to the 80s. It's bringing back so many memories of when I was a kid, from the clothes to hearing the songs. It's just great music." After turning his back on acting as a child, the Wiri-based printer is enjoying the stage again. "I did it in primary school for five years but then I became a teenager and didn't do it for 17 years. It's my happy place, an escape from work. And it's awesome." Fame, The Musical from April 12 to 27. Call 361 1000 or visit iticket.co.nz for tickets.